This qualitative study used survey research to examine a blended co-taught model of instruction designed for students enrolled in an Occupational Course of Study via the North Carolina Virtual Public School. While blended learning has successfully served the needs of students with disabilities, face-to-face and virtual teachers identify the need for professional development to successfully implement the model. Our large scale survey of educators teaching in a blended program to meet the needs of these students demonstrates the need for multiple layers of support. Lewis, S. & Garrett Dikkers, A. (2016). Professional Development Supports for the Blended, Co-Taught Classroom. 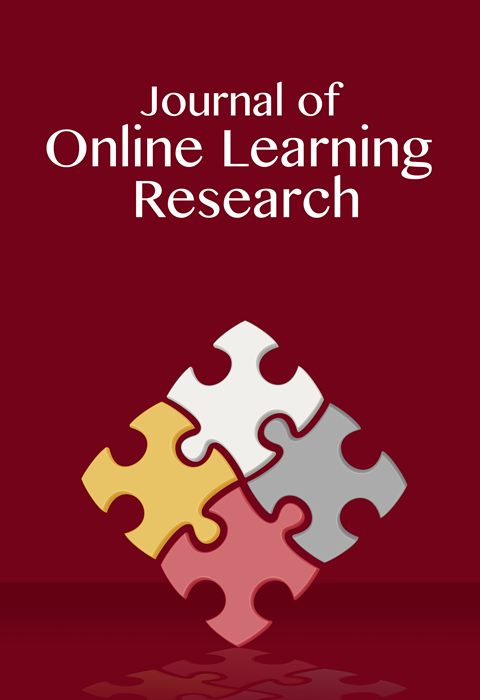 Journal of Online Learning Research, 2 (2), 103-121. Waynesville, NC USA: Association for the Advancement of Computing in Education (AACE). Retrieved April 24, 2019 from https://www.learntechlib.org/primary/p/171356/. Archambault, L.M. (2011). The practitioner’s perspective on teacher education: Preparing for the K-12 online classroom. Journal of Technology and Teacher Education, 19(1), 73-91. Austin, V.L. (2001). Teachers’ beliefs about co-teaching. Remedial and Special Education, 22(4), 245-258. Babbie, E. (1973). Survey research methods. Belmont, CA: Wadsworth. Bandura, A. (2007). Much ado over a faulty conception of perceived self-efficacy grounded in faulty experimentation. Journal of Social and Clinical Psychology, 26, 641-658. Bulgren, J.A., Marquis, J.G., Deshler, D.D., Schumaker, J.B., Lenz, B.K., Davis, B., & Grossen, B. (2006). The instructional context of inclusive secondary general education classes: Teachers instructional roles and practices, curricular demands, and research-based practices and standards. Learning Disabilities: A Contemporary Journal, 4(1), 39-65. Creswell, J.W. (2009). Research design: Qualitative, quantitative, and mixed methods approaches (3rd ed.). Los Angeles, CA: Sage Publications. Creswell, J.W. (2013). Qualitative inquiry and research design: Choosing among five approaches (3rd ed.). Los Angeles, CA: Sage Publications. Garrett Dikkers, A., Lewis, S., & Whiteside, A.L. (2015). Blended learning for students with disabilities: The North Carolina Virtual Public School’s co-teaching model. In M.F. Rice (Ed. ), Exploring pedagogies for diverse learners online-Advances in research on teaching, Volume 25, (67-93). West Yorkshire, United Kingdom: Emerald Group Publishing Limited. Guskey, T.R. (2003). What makes professional development effective? Professional Development That Works, 748-750. Halverson, L.R., Graham, C.R., Spring, K.J., & Drysdale, J.S. (2012). An analysis of high impact scholarship and publication trends in blended learning. Distance Education, 33(3), 381-413. Kennedy, K., & Archambault, L.M. (2011). The current state of field experiences in K-12 online learning programs in the U.S. In M. Koehler& P. Mishra (Eds. ), Proceeding of society for information technology& Teacher education international conference (pp. 3454-3461). Chesapeake, VA: AACE. Lewis, S., Whiteside, A.L., & Garrett Dikkers, A. (2015). Providing chances for students to recover credit: Is online learning a solution? In M.F. Rice (Ed. ), In M.F. Rice (Ed. ), Exploring pedagogies for diverse learners online-Advances in research on teaching, Volume 25, (143-157). West Yorkshire, United Kingdom: Emerald Group Publishing Limited. Manfreda, K.L., Bosnjak, M., Berzelak, J., Haas, I., Vehovar, V., & Berzelak, N. (2008). Web surveys versus other survey modes: A meta-analysis comparing response rates. Journal of the Market Research Society, 50(1), 79. Means, B., Toyama, Y., & Murphy, R. (2010), The effectiveness of online and blended learning: A meta-analysis of the empirical literature. Teachers College Record, 115(030303), 1-47. Morocco, C.C., & Aguilar, C.M. (2002). Coteaching for content understanding: A school-wide model. Journal of Educational and Psychological Consultation, 13, 315-347. North Carolina Virtual Public School. (2016). Getting to know NCVPS. Retrieved from http://www.ncvps.org/index.php/getting-to-know-ncvps-2/ Powell, A., Watson, J., Staley, P., Patrick, S., Horn, M., Fetzer, L., Hibbard, L., Oglesby, J. & Verma, S. (2015). Blended learning: The evolution of online and face-to-face education from 2008-2015. International Association for K-12 Online Learning. Ravitch, S.M., & Carl, N.M. (2016). Qualitative research: Bridging the conceptual, theoretical, and methodological. Thousand Oaks, CA: Sage Publications, Inc.
Sandholtz, J.H., & Ringstaff, C. (2014). Inspiring instructional change in elementary school science: The relationship between enhanced self-efficacy and teacher practices. Journal of Science Teacher Education, 25(6), 729-751. Shih, T.H., & Fan, X. (2008). Comparing response rates from web and mail surveys: A meta-analysis. Field methods, 20(3), 249-271. Tschannen-Moran, M., & McMaster, P. (2009). Sources of Self-Efficacy: Four Professional Development Formats and Their Relationship to Self-Efficacy and Implementation of a New Teaching Strategy. The Elementary School Journal, 110(2), 228–245.